Who would have thought cows can be damaging the environment? The difference is in the type of food they consume. Does sustainability matter to you when buying meats? When a survey I conducted of 100 people, more than a third (39%) of the people surveyed did not understand the concept of sustainably grown meat. Do you try and buy meat that is pasture-raised or has a healthy-label? 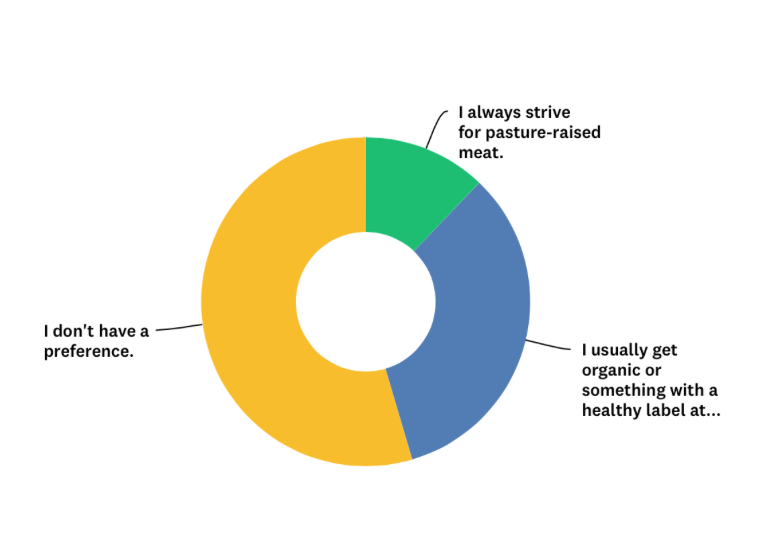 When asked if they try and buy meat that's pasture-raised or has a healthy label, more than half (54.4%) did not have a preference on the way their meat was grown. That's a lot of numbers, but what exactly are healthy labels communicating about the food they represent? Grass-fed meat means the animal’s diets aren’t supplemented with corn, soy, animal byproducts, or synthetic hormones. Pasture-raised is a traditional farming practice where animals are raised in a “humane, ecologically sustainable manner” and are not in confined facilities. "I love meat, but I also love my body. My hope is that people pay attention to the meats that they are eating and understand that the way nature intended animals (including us!) to eat is the best way!" Eating local is a practice she advocates as well to promote healthy living. Wagon Wheel Ranch in Watkinsville, just 14 miles south of Athens, is a 40-year old family farm that is certified by the American Grassfed Association and an option for Athens and surrounding area residents to find grass-fed beef. They also incorporate a sustainable pasture rotation system with their cattle. John William Gentry, a meat lab technician at the Animal and Dairy Sciences building on campus, agrees with the idea of local eating as well. The similarities stop there, as he believes the practice of grass-fed animals is a niche market. His definition of sustainability is "something that will be there in the future, and not detrimental to the environment." Cows that eat only grass produce more methane and therefore impact the environment negatively, which isn't more sustainable as studies show. 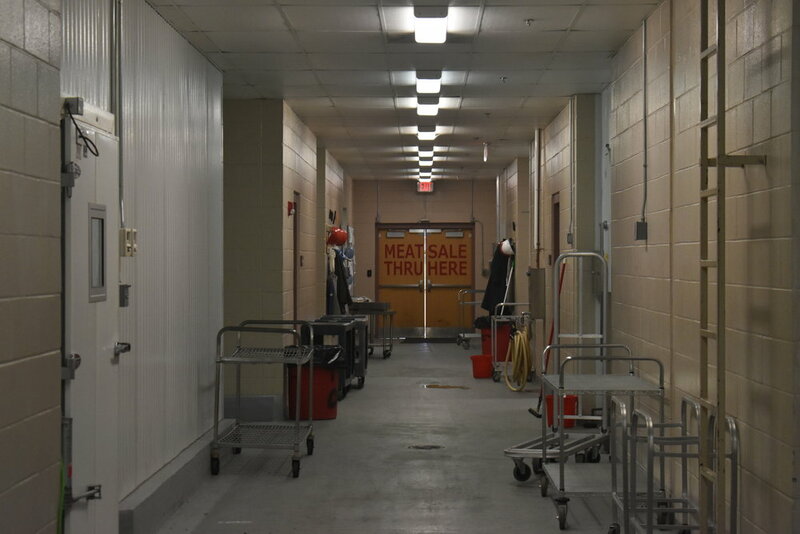 The Animal and Dairy Sciences building has meat sales every Friday where they sell meat from the UGA raised cows. The Food and Agriculture Organization says the issue with grain-fed animals is that the production of the feed, as well as transportation emissions from taking cattle to be slaughtered have a negative environmental impact as well. Having experience in judging meat for over 4 years, Gentry has seen a difference in grass-fed vs. grain-fed meat quality. He says corn-fed animals put on more fat at a quicker pace, so the meat from a grain-fed cow is more likely to have marbeling and a higher yield grading. Grass-fed cows are more lean and take a longer amount of time to put on weight. "It all depends on if you want a steak to taste good or not." There is still research and experimentation being done to see if grass-fed meat is actually healthier than grain-fed, and earlier this year, the FDA funded a campaign to inform people about genetically modified organisms. John William believes with the research needed to disprove the stigma surrounding grain-fed meat will take longer than in our lifetime. The average time for the FDA to approve GMOs is 13 years, but that may be happening sooner than we think. If both have negative environmental impacts, when it comes down to it is there truly a difference in the quality of meat?